That CBS/NYT/Quinippiac poll that we raised questions about here may have been on to something. The poll showed Obama with a lead in three key states: Ohio, Pennsylvania and Florida. Hugh Hewitt interviewed Quinippiac’s Peter Brown about the poll when it was released last week and I thought Brown did a credible job of defending it. He explained that Quinippiac does not use a voter model to adjust its results. It surveys large random samples and takes them as they are. 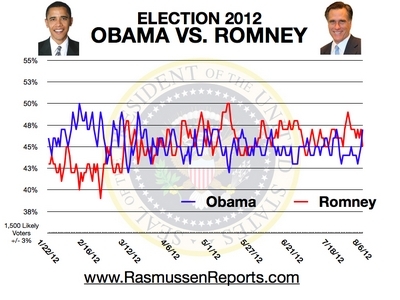 Obama has taken a lead over Romney in the latest Rasmussen Reports daily presidential tracking poll, 47-44 percent. The result is susceptible to various interpretations; Rasmussen notes that this is only the second time in more than two months of daily tracking that Obama has reached the 47 percent level of support and that Romney led by four on Friday morning just before the jobs report: “As with all bounces, it remains to be seen whether this reflects a lasting change in the race or is merely statistical noise.” Forty-seven percent so far represents a ceiling in Obama’s support. That should be a problem for the incumbent. Rasmussen adds, however, that among all voters not affiliated with either major party, Obama leads by 9. Rasmussen links Obama’s bounce to Friday’s jobs report, which I thought was a downer. I wonder if the negative advertising that Obama is running in swing states is paying dividends compounded by Romney’s inability to match it until after he is formally named the GOP nominee. In any event, for reasons we have discussed here previously, we think Rasmussen runs the best public poll and it is worth following if you want to understand the dynamics of the race. UPDATE: In today’s release, which the link above takes you to, Rasmussen has the presidential tracking poll at 46-45 in favor of Obama, leaving the race a dead heat. JOHN adds: This is at least the fourth time when it has appeared that Romney might be pulling away in Rasmussen’s survey; each time Obama has bounced back. It remains to be seen whether Obama’s current resurgence (as Scott notes, he has only a one point lead as of today) is meaningful or just background noise. For what it is worth, the Gallup Poll has not shown any similar Obama surge in recent days. I agree with Scott that Obama’s “bounce,” if it really is a bounce, is not related to the latest jobs report, which was neutral for Obama at best. I fear that if it is real, it is due to the vicious attacks the Democrats have mounted against Romney, including misleading television ads as well as smears by the likes of Harry Reid. Further, whether the current Obama bounce is real or not, I think that these attacks are keeping Obama’s campaign afloat despite his miserable record. We keep hearing that Romney will begin spending seriously after the GOP convention; let’s just hope that by then, it still matters.